People often think of graduation as a send-off, a launching into the broader world. In the case of the International Yacht Restoration School in Newport, R.I., a launch took center stage at its recent commencement ceremony. 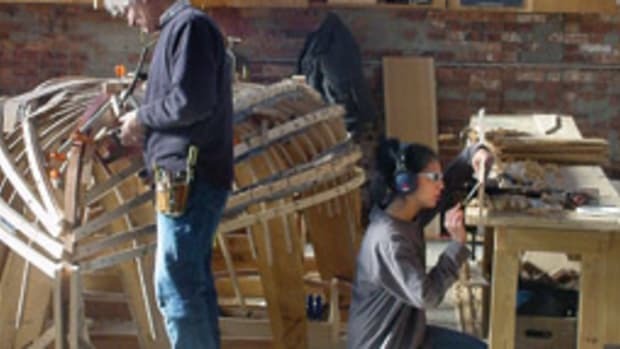 Graduates from the two-year boatbuilding and restoration program and the one-year marine systems program got the opportunity to sea-trial the boats they have spent the year restoring. 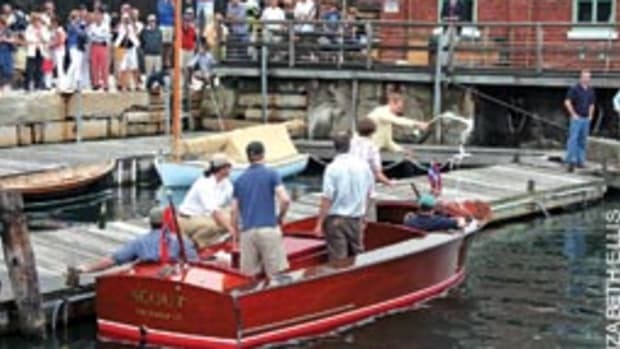 Other boats launched at the June 6 event included the 35-foot motor launch Corsair — originally launched in 1939 for financier J.P. Morgan — a Herreshoff 12-1/2-footer, and a 15-foot replica of a 19th-century Whitehall rowing boat. Graduate Bill Flaherty, 31, who helped restore Corsair, says his last two years have been unbelievably rewarding. Flaherty grew up in Litchfield, Conn., and began taking summer sailing courses in Noank, Conn., when he was 10. His first “boat” — built as a young child — was an inner tube with a wooden platform and a beach chair attached. After graduating from high school, Flaherty went into the Army for four years as a diesel mechanic. 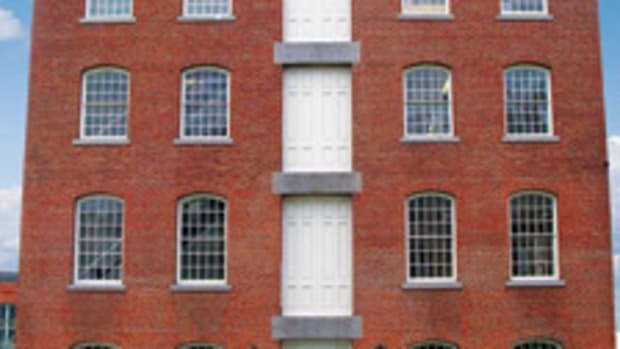 In 2002, he decided to try building furniture for Hitchcock Fine Home Furnishings in Riverton, Conn. While that satisfied his need to create and get out of mechanical work, the idea of building boats wouldn’t leave him. He checked out a few schools, but couldn’t find the right fit, so he skipped to another career and began working at Hopkins Vineyard in New Preston, Conn.
Flaherty did more research online, found out about IYRS and decided to check it out. He liked what he saw, so he enrolled two years ago and hasn’t looked back since. Flaherty currently has summer employment at Mount Hope Boatworks in Newport, R.I., where he was able to work part-time during his time at IYRS. Keith Brown, 39, found his way to IYRS through his mother and a graphic design career that wasn’t satisfying anymore. Brown says his parents owned a Sparkman & Stephens 24-foot Rainbow and a 14-foot wooden Grady-White. After graduating from Maine College of Art with a degree in graphic design, Brown went into business for himself in Burlington, Vt., creating promotional fliers for sporting events. He pursued that career for 15 years before making the switch. really wasn’t sure what to expect, but after learning the basic skills he was able to build a classic Beetle Cat with a team. “It’s really great to stand back and say, ‘I built that,’ ” says Brown. The second year, while working on the 12-1/2 Herreshoff, Brown looked to instructor Warren Barker for inspiration. “I would ask myself in situations, ‘What would Warren do?’ ” says Brown. These days, Brown can’t imagine living anywhere else. 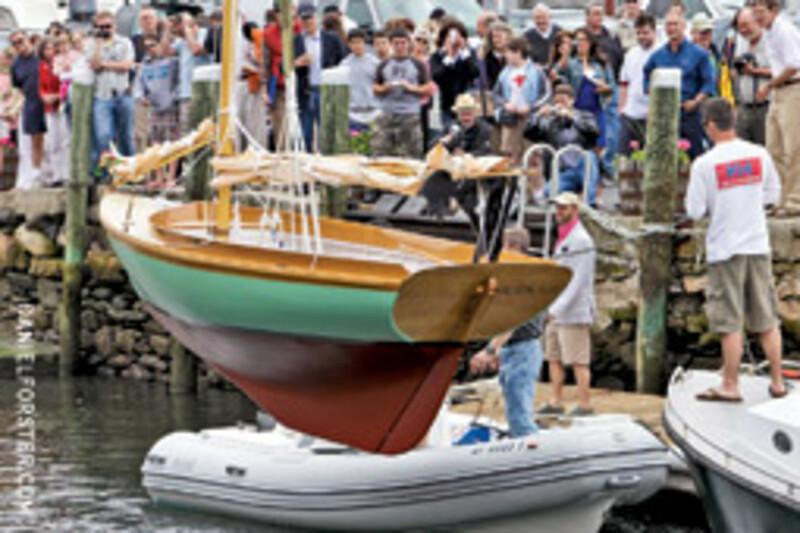 Newport and its historical vessels are a source of great inspiration to Brown, an aficionado of older boats. 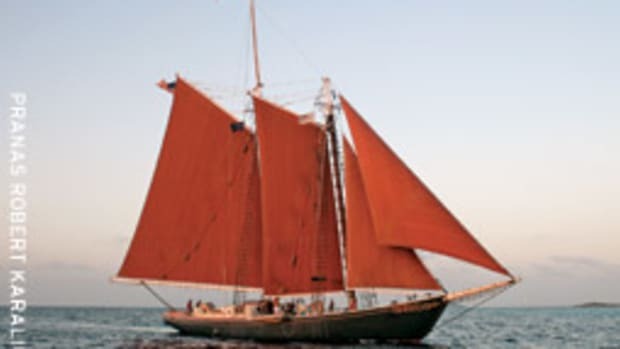 This summer, he will be the caretaker for Skylark, a 53-foot 1935 Sparkman & Stephens yawl that has recently undergone an extensive refit.